The spark is back. There is a ways to go before we can say that it’s all the way back, but it’s there. A convincing 28-13 win on Monday night over the Washington Redskins at Lincoln Financial Field gave the Eagles their first two-game winning streak of this season, evened their record at 6-6, and set up a showdown for the top of the NFC East on Sunday in Dallas against the Cowboys. It feels so promising, doesn’t it? Opening the game with a crisp 12-play, 75-yard drive that ended with a Carson Wentz touchdown pass to wide receiver Golden Tate set the tone, but the Eagles really took control of this game in the second half, when they outscored a punchless Washington team, 14-0. There was a lot of good in this win, some not-as-good, and much to ponder with a third straight division game waiting. The offense moved the ball at will, amassing 436 total net yards, having balance with 130 rushing yards on 33 carries, and spreading the football around in the passing game. A key matchup was the Eagles’ offensive line against an outstanding Washington defensive front seven, and the Eagles dominated the challenge. The Eagles kept Wentz clean and right tackle Lane Johnson limited standout edge rusher Ryan Kerrigan to just two tackles and not a whiff of Wentz in the pocket. So did the running backs, led by rookie Josh Adams’ 20 carries and 85 yards and Corey Clement’s five carries and 27 yards. Having Darren Sproles back provided a boost as well, as he scored from 14 yards out on a sweep left led by center Jason Kelce’s terrific lead blocking. On the play, Kelce wiped out two Washington defenders to give Sproles a chance to score. The running backs combined for 29 carries and 134 yards. Not a bad night at all. And as the running game established itself, the passing game came alive. The first-possession touchdown gave the Eagles a lead and some offensive momentum, something they haven’t had much of this season. Wentz completed passes to six players, led by tight end Zach Ertz’s nine receptions for 83 yards as Ertz set a single-season franchise record for most receptions in a season (93, with four games remaining). On this night, though, it was more than Ertz. The outside receivers made big plays, too. 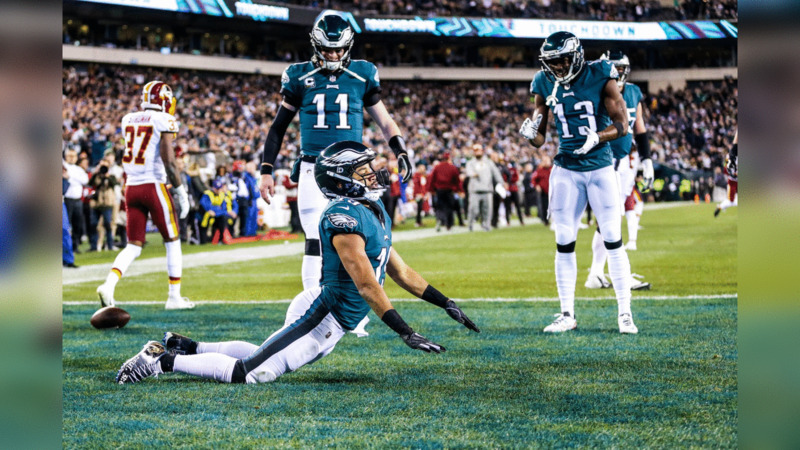 Golden Tate had seven receptions on seven targets, gaining 85 yards and scoring the opening-drive touchdown and then making a shoe-tops catch of a Wentz pass to convert a two-point attempt. Nelson Agholor was open down the field and caught four passes for 56 yards while Alshon Jeffery chipped in with three catches and 31 yards. Jordan Matthews made his lone reception count, a 4-yarder to score a touchdown. Defensively, the Eagles shut down Washington for all but one play, a 90-yard Adrian Peterson touchdown run that put Washington ahead, 10-7. Otherwise, Washington had nothing going – 14 yards rushing and a combined 150 passing yards from quarterbacks Colt McCoy and Mark Sanchez. The front four put good pressure on the quarterbacks and the open-field tackling was solid, helped by the return of cornerbacks Sidney Jones and Rasul Douglas to the field. On special teams, Cameron Johnston had a 46-yard net punting average and placekicker Jake Elliott made both of his field goals and his two PAT attempts. Whenever you win, you pick through the good stuff to find the teaching points, and there were a few from this victory. The 90-yard Peterson touchdown run happened when linebacker Kamu Grugier-Hill couldn’t get off a block and Jones missed a lunging tackle attempt. The Eagles can’t give up big plays in the running game. They also left points on the field on offense, converting two of four opportunities on goal-to-goal situations. A fourth-down run from Adams at the 1-yard line was stuffed for a 2-yard loss, and Wentz had a first-and-goal pass from the 5-yard line intercepted when he threw behind Jeffery running a slant. Whether that was on Wentz or on Jeffery and the route he ran makes no difference: The Eagles cannot get into scoring position in the games ahead – at Dallas and Los Angeles, home with Houston, and at Washington – and leave without points. Otherwise, the game was pretty solid. Wentz missed some open receivers here and there and he’ll beat himself up as he watches the film of the game, but he’ll be ready for Dallas. • Is the running game something the Eagles can, finally, lean on for good the rest of the season? Adams is hitting his stride with that deceptive approach to the line of scrimmage and the burst through holes and to the outside, and Clement has his game back after a quad injury hampered him most of the season. Sproles is an X-factor here. If he’s healthy, the Eagles have a good matchup player to mix into the offense. 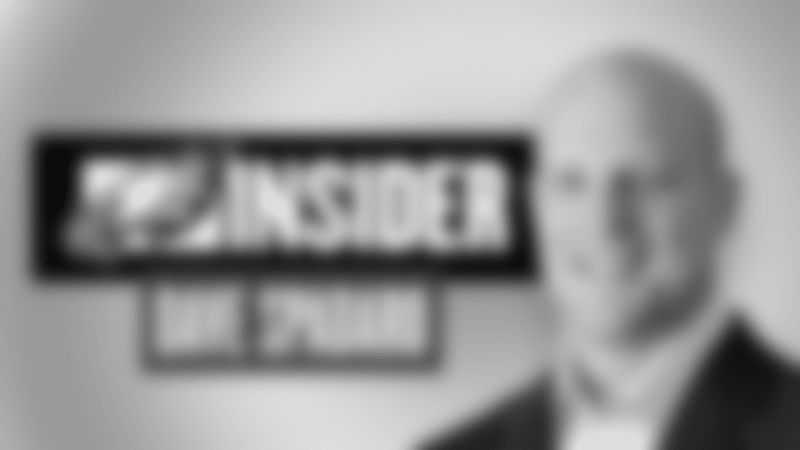 • Could defensive backs like Avonte Maddox and Jalen Mills, and maybe even middle linebacker Jordan Hicks, come back to the lineup for Dallas? The game kind of means everything to a team that is still in must-win mode. • Is the offensive line peaking at just the right time? That’s a good defensive front seven the Eagles dominated on Monday night. Another one awaits on Sunday in Dallas. • Has the offense, as a unit, found the light after a season of too many mistakes? There were encouraging signs in the win over New York and even more on Monday night. The Eagles had balance, they incorporated Tate, and they basically had their way with Washington’s defense until they made too many mistakes in the red zone. The tempo, the energy, and the many opportunities for big plays were there on Monday night. Some sizzle is back for the Eagles. The spark has returned. The Eagles, given up for dead by some after the embarrassing loss to New Orleans a few weeks ago, are right back in the thick of things in the NFC East and in the NFC playoff picture after two straight victories. That doesn’t change the “must-win” mentality, but you get the sense that this team is relishing the opportunity to go to Dallas and stay hot against a team that turned the tables at Lincoln Financial Field following the bye week. A team searching for its identity all season just might be on to something at the right time down the stretch in this regular season.